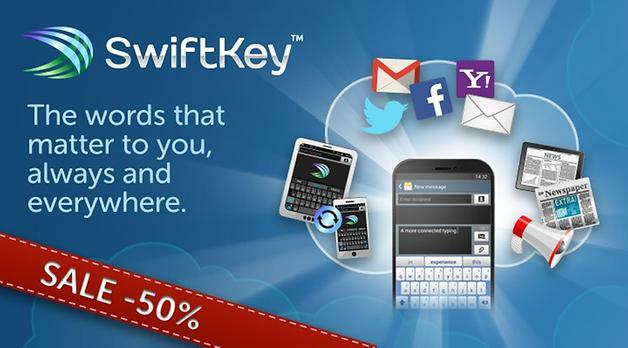 50% off and new personalization features: SwiftKey 4.2 Cloud rolls out. Fans of the SwiftKey app, the awesome and time saving replacement for touchscreen typing, will be pumped to know that a new version of the flow keyboard service is now available in the Google Play store and Amazon for 50% off. This is to celebrate the arrival of SwiftKey 4.2 which has brought along some great new features to make writing SMS, emails and everything else even easier and less time-consuming, for which we mostly have the new Cloud Sync to thank. The main feature that has been brought to SwiftKey is the incorporation of Cloud Sync which has broadened the scope of their personalization services. Thanks to the new ”Backup & Sync” feature, you’ll be able to synchronize your personal dictionaries between multiple devices, be it a smartphone or a tablet, despite the fact that they might be running on different versions of the software. 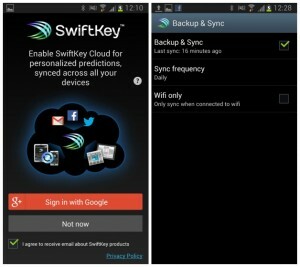 SwiftKey has achieved this by syncing not through the APK package name, but through your Google account. In the Backup & Sync settings, you can choose how often you would like to sync as well as if you would like to sync only when connected to WiFi. Cloud Sync works with your Google account, so you can use one profile on multiple devices. Choose sync frequency on the right. Using various channels, SwiftKey also is on the constant look-out for trending phrases around the globe, as well as in your location, depending on what country and language you chose during initial setup. You can choose up to three languages from 60. Another feature of the newly released Cloud Sync is the ”Enhanced Personalization”, where the user now allows SwiftKey to ”learn” from your SMS, Gmail, Twitter, Yahoo! and RSS feeds. By tapping into these sources, the service keeps tabs on how you express yourself for better next-word predictions and auto-corrections. What’s more, you can use multiple accounts if you have more than one per social network. By simply tapping on each of them individually, SwiftKey ”re-learns” the words and phrases that you’ve used there, thus creating your own personal language profile. It will also state how long it has been since the last lesson. By tapping on all of your social networking services, SwiftKey can ”learn” how you express yourself. The best part of this whole story is the dollars you will be saving. For a short time only, you can purchase SwiftKey in Google Play for $1.99, a one time payment that is in my opinion definitely worth it. For now, Amazon has not received the update, but the offer stands there as well. There is a free trial version that lasts 30 days, but you might not want to wait because the offer won’t last forever.